This is the most expensive of the pineapple in the world. It costs around 16000 US $ and is grown inside the earth. The technique is called “Victorian” style. It is grown in a pit 40 feet long and 4 feet wide to develop the taste and flavor. This Victorian technique was restarted during the first world war. The fruits are so prepared by working on land extensively by a group of gardeners and cultivated in Cronwall, UK at the Lost gardens of Heligan, which is in the South coast of Mevagissey village. Horticulturalists have been able to create tropical conditions in small greenhouses heated using a chemical reaction between 30 tons of horse manure and urine, and piles of straw. The manure is procured from stables near Falmouth, on south coast of the UK. The fruit is nurtured by filling the surrounding pits with stinking horse manure and straw. The Victorian pit is flanked with a pair of pits around the growing fruit. The trenches are filled with decayed manure by the action of bacteria and fungi; on decomposing giving heat due to rotting horse manure and urine regularly. The decomposition of horse manure and excrement generate heat, which is channelized through the adjacent walls of the pit to provide warmth to the growing fruits. Though it might sound less than appealing, but the fruits never come in contact with the excrement.The ‘Hotbed’ system of cultivating pineapple can be traced back to the time of Charles II. Using this method the gardeners at Heligan’s Pit have started producing some of the most delicious pineapple flavors. 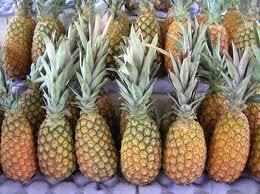 Pineapple has also been a symbol of hospitality, friendship and many more in different cultures of the orient. Once the tasty fruit, they can hardly be termed as exotic these days, thanks to the globalization and improvement in storage, production as well as crop improvement. Though Pineapple can be bought for a decent price, but the cost of the most expensive pineapple can just make your jaw drop.